My first story is about a conversation I had at the therapist’s office. There was a young intern from a local college with whom I became engaged in conversation. It started out by my asking “What have you learned in this intern experience, especially the kinds of things that weren’t written in your textbooks or discussed in the classroom?” As I tried to draw things out of her, staff therapists who were in the room became rather interested in our conversation. As our discussion unfolded, I found myself doing most of the talking explaining to the intern many observations about my lengthy experience in recovering from a stroke in the hospital, at two rehabilitation facilities and then at home. After a while, I realized that I was doing all the talking and everyone seemed to be listening, but were they being courteous and tolerant of my rambling or were they genuinely attentive? So I quickly stopped my stories and apologized for monopolizing the conversation. But their response surprised me. They asked me to keep talking and one therapist commented, “We seldom hear the patient’s point of view” and another stated “You should write a book”. Rather instantly, a thought was born but almost as instantly it submerged into a deep compartment in my brain. ​But a few days later my second story occurred and the first story resurfaced. This time I was at another therapy center that specializes in hand and arm rehabilitation. I was doing some very strenuous exercises moving my arm forward and backward and from side to side. Rather proud of what was being accomplished, I commented to the therapist “that was good” to which he responded “you are almost there” to which two words just fell out of my mouth “Where’s There?”. This flooded me with memories of the past two years during which I have been recovering......memories of how many times I have heard “you are almost there” and the mysteries that lay ahead as I discovered the meaning and goal of “THERE”. This has been an incredible journey and perhaps I have a story to tell that might provide comfort to some patients and their families as well as enlightening some caregivers. As I reflected on the numerous “almost there’s” on my thus far journey of recovery (or at least improvement), I looked at the therapist and blurted out “that’s it.......the title of my book must be “WHERE’S THERE?” And it was that singular revelation about the name of a book that inspired me to seriously attempt to capture my thoughts and share the lessons learned along the way. Thinking about “there” is what this book is all about. The concept of getting to “THERE” meant so much to me on this journey and it has captured so many feelings and struggles and goals. Actually, I wish to share a third story which helps define this book. My stroke cast a terrible burden upon my family: my wife Mary and our three children Meryssa, Mitchel and Marlee; my two daughters Michelle and Mimi from a prior marriage; and a number of relatives and countless friends. Mimi seized upon a way to cope with her feelings and reach out to the many people who were anxious to know how I was doing.....she started a blog. Mimi inherited my father’s gift of writing and has been able to reflect on my progress in a way that I could never do, and it unfolds into a story about a stroke from the perspective of a loving family member. So, I have decided to share both stories, hers and mine. Each chapter of this book includes her sequential blog(s) and then continues with my meandering thoughts about what I have learned throughout this journey. I hope this book sheds some light and provides some comfort to those of us who have experienced a stroke and to the families and friends and caregivers upon whom we depend. The photograph on the cover of this book is a self-portrait taken by the author, Michael Wacholder. 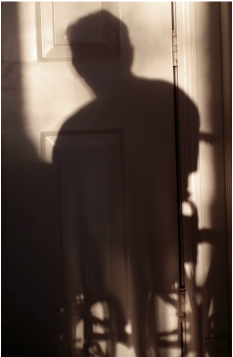 One late winter afternoon......the sun, low in the western sky, came streaming through the windows of his home casting a distinct shadow of Wacholder in his wheelchair. He grabbed his camera to capture the image because it seemed so symbolic of the extremes one goes through in recovering from a stroke. The contrast of SUNLIGHT and SHADOW......representing HOPE and DESPAIR, COURAGE and FEAR, unwavering BELIEF and unending LONELINESS.....emotions through which the stroke survivor travels constantly. This singular picture is another way of telling his story.